Location: Suneo Helios Beach (ex. 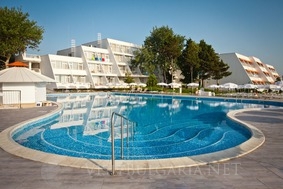 Luca Helios Beach) is an all-inclusive hotel in the beach resort of Obzor on the Black Sea Coast. This beachfront hotel consists of 2 3-and 4-storey buildings and is situated 150 metres from the nearest shopping centre, 300 metres from the centre of Obzor, 60 km from Varna Airport and 70 km from Burgas Airport. Accommodation: The hotel offers an excellent assortment of tastefully decorated, fully-equipped rooms. The rooms feature bathroom with shower and w.c., hairdryer, telephone, free Wi-Fi internet, air-conditioning, in-room safe, satellite TV, mini-fridge, balcony. Some of the rooms offer sea views. Wine & dine: The hotel operates on All inclusive basis. Unwind in the inviting lobby bar, sample a fine selection of cuisine in one of the 2 elegant restaurants and admire the stunning sea views from the beautiful terrace.